Falling + Parachute = Crazy Fun! 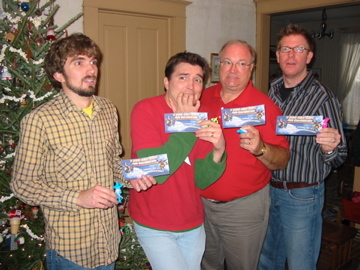 Last Christmas Randy, his dad Rick, brother Adam & brother-in-law Jeff all received skydiving gift certificates for Christmas. They did their jumps in Richmond, Indiana in July. I’m really not sure what I thought of skydiving up to that point. The idea of jumping out of an airplane certainly wasn’t appealing, but the falling part (provided there was a soft landing) did sound cool. After watching Randy jump, I knew I’d like to do it someday. But it’s not cheap, so I figured it would be years out (if ever). 12:42:11 PM Randy: What are you doing on Saturday, September 20, at 10am? 12:42:38 PM Randy: In Greensburg? 12:42:46 PM Jen Cox: Huh? 12:42:55 PM Randy: I think you’re skydiving. 12:43:05 PM Jen Cox: Wha? 12:43:55 PM Randy: Some friends of someone here at Compendium are putting together a group to go skydiving in Greensburg, and they got a great deal. 12:44:04 PM Jen Cox: How much? 12:44:16 PM Randy: Not the regular price of $239. 12:44:32 PM Randy: Not the normal group discount price of $189. 12:44:43 PM Randy: But the AWESOME discount price of $169. 12:45:15 PM Randy: So, do you want to go skydiving for your birthday/anniversary present? 12:45:25 PM Jen Cox: How can I refuse? 12:45:29 PM Randy: How much is the cruise? 12:45:54 PM Jen Cox: Oh, the cheap cabin is $749. Airfair not included, of course. 12:45:57 PM Randy: You could say that you’d rather not go skydiving. That’s how. 12:46:10 PM Randy: Oh, this is WAY cheaper, and far more dangerous. 12:46:20 PM Randy: So, are you in? 12:46:23 PM Jen Cox: All right–sign me up! 12:46:36 PM Jen Cox: That’s crazy. 12:46:40 PM Jen Cox: You’re awesome. We went to Stuckey Farm yesterday. 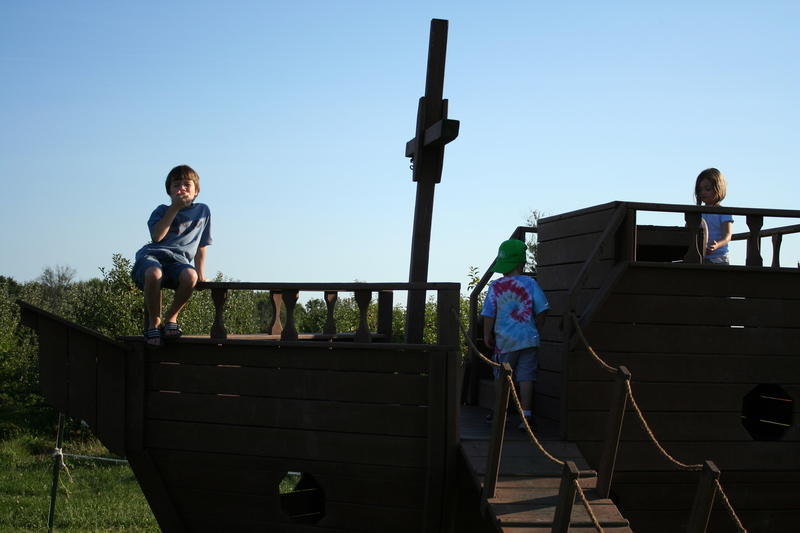 The kids had fun playing on the pirate ship. Sam & Toby fought over who got to be captain. Great fun was had by all. 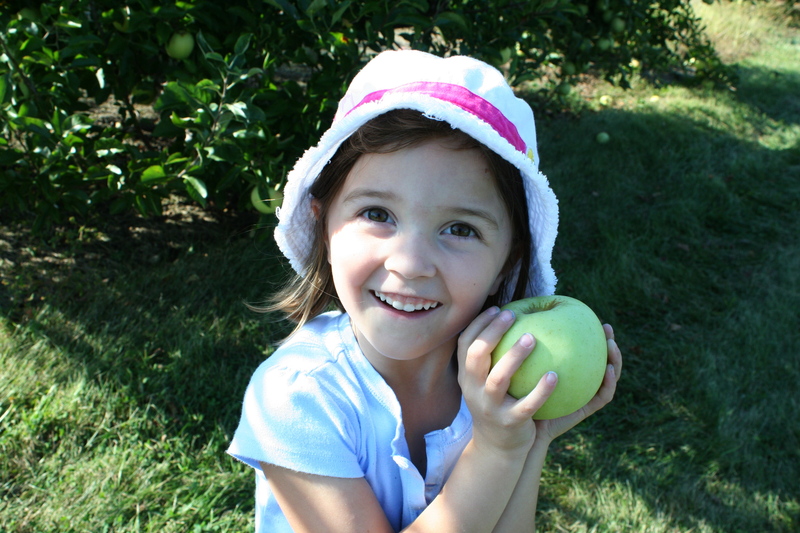 Oh, yeah–and we picked apples! Apparently I’m a little behind on laundry. 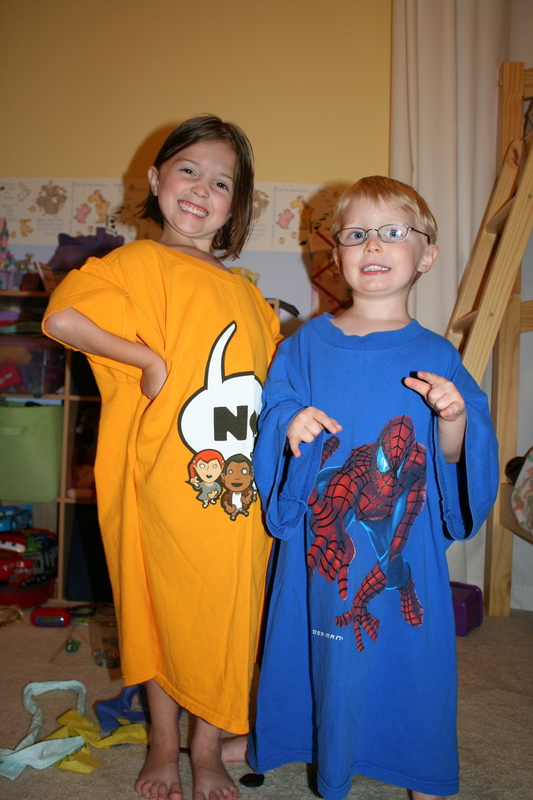 Samantha didn’t have any clean pajamas the other night, so I dug one of Randy’s old shirts out of the closet. Of course, Toby wanted one, too. Luckily, I had just the thing. Randy & a friend recently went to a junkyard looking for car parts. He didn’t find the main part he wanted but found a few other things on his list. One was the little motor that opens the driver-side back window on the van. 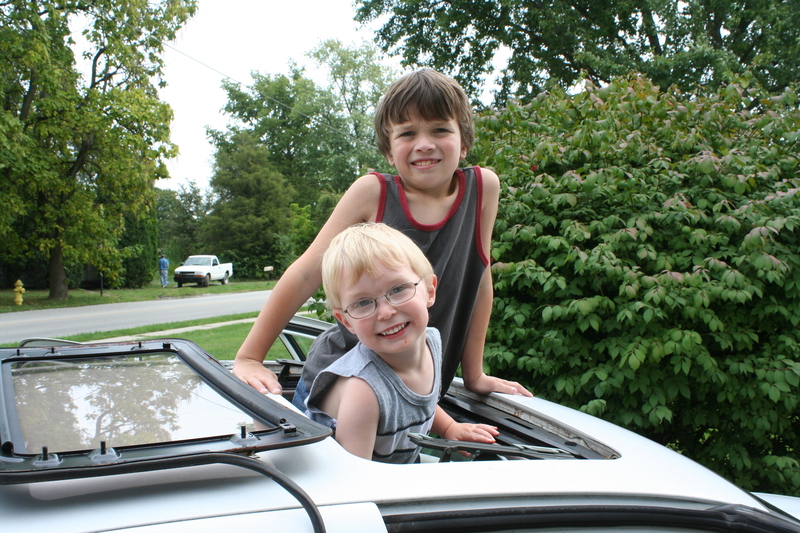 Another was a replacement sunroof for the Altima. Very exciting! The trim had come loose a while back. One beautiful day as I was retracting the roof I heard an awful crunching sound. I didn’t realize until later that it had totally chewed up the trim. (Oops!) I called a Nissan dealer and inquired about replacement trim. The trim, itself, was $76. 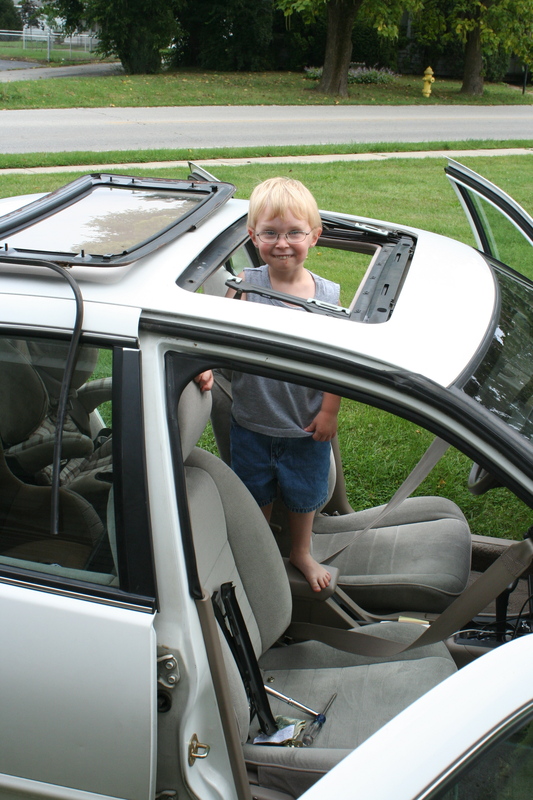 A complete replacement sunroof would be $500. (Yowza!) Randy paid under $15 for the replacement and had it installed in no time. Go, Randy! 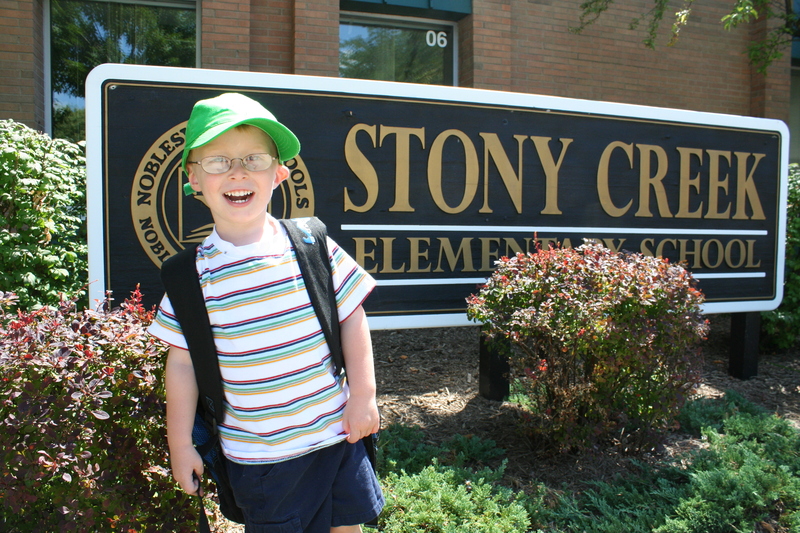 I’m so thankful that Toby was allowed in the preschool program at Stony Creek Elementary. 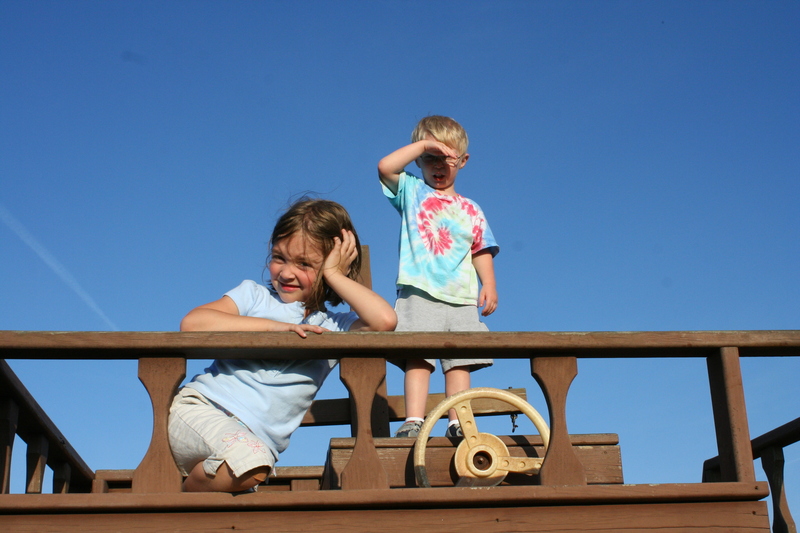 Ethan & Samantha never went to preschool. 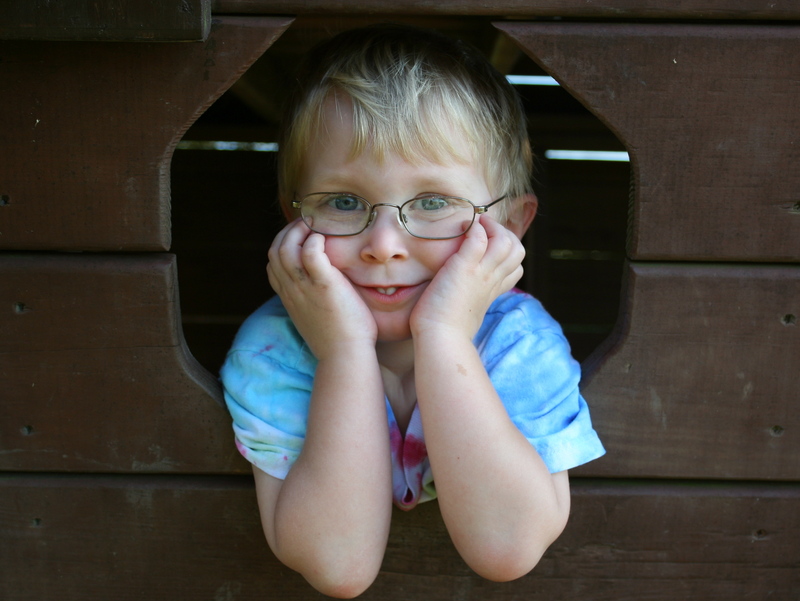 I’ll admit I was kind of anti-preschool when Ethan was that age. He didn’t seem to need it–he knew the fundamentals and got plenty of socialization at church (Sundays & Wednesdays) and MOPS, twice a month. 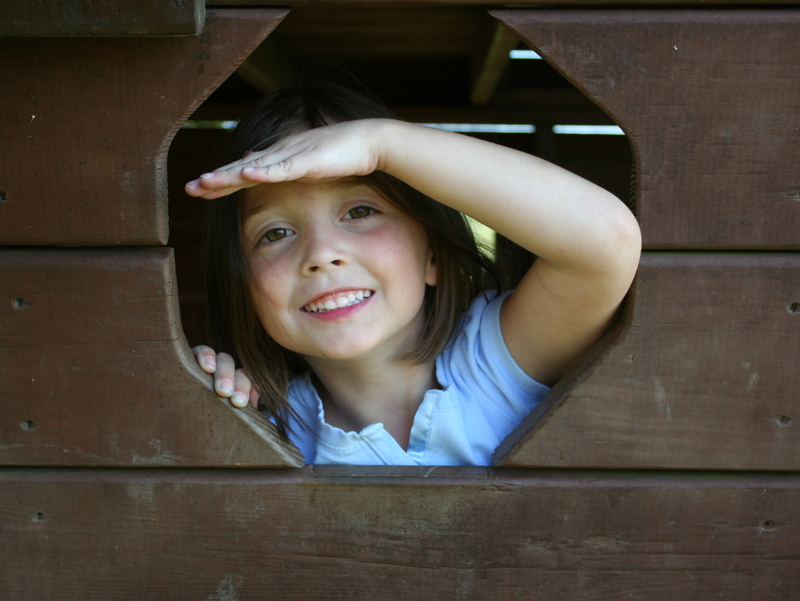 When Sam was 4 or 5, though, I could really see how she (I) would have benefited from preschool. She (I) really needed an outlet. Unfortunately, preschool was cost-prohibitive. 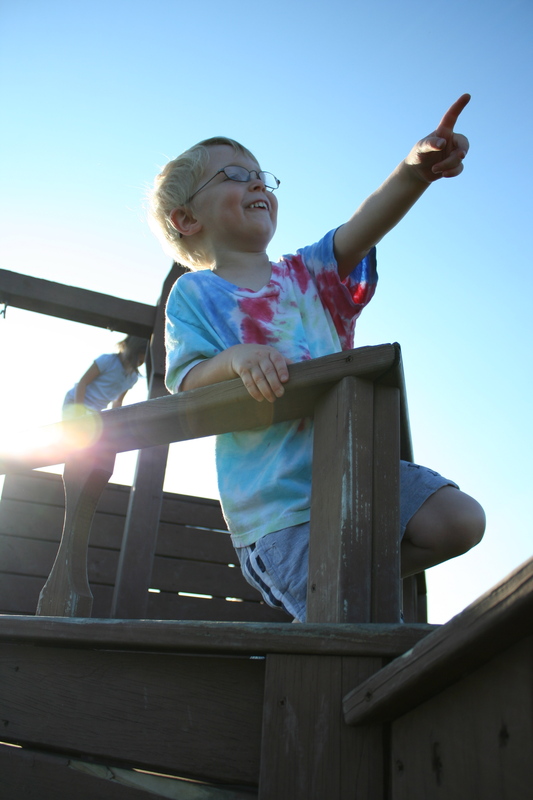 It was a huge blessing when they had space for Toby in the early childhood program. Mrs. Holbrook is awesome (and so is her aide, Ms. Gysin). I can tell they really love working with these kids. It’s been fun for me to see how much Toby has learned in the past 4 weeks. For several months he’s been interested in writing his name. That “B” was tough, though. He’s doing really well at writing it now. Next year he’ll have an advantage I never had going into kindergarten: he won’t have any problem spelling his last name. I remember that I always had to ask my kindergarten teacher how to spell my last name (Burkhalter). One day she finally told me I was going to have to learn to spell it on my own. 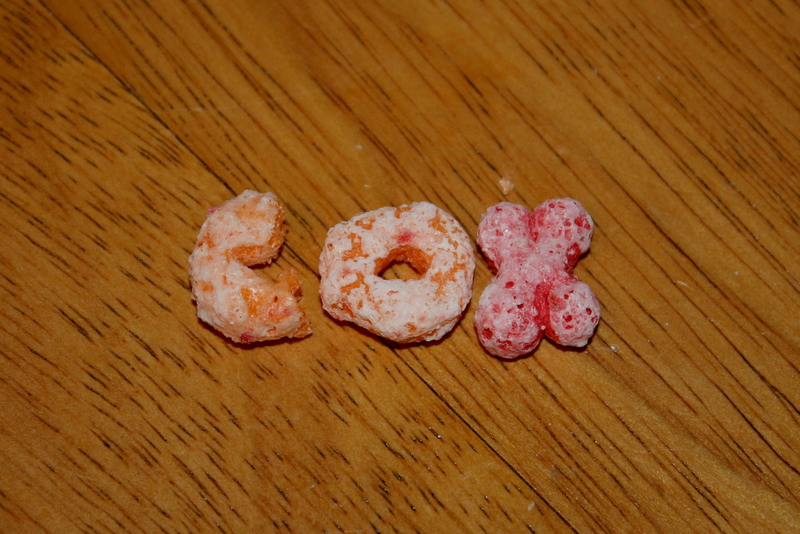 Well, Toby is 4 and he can already spell his last name. 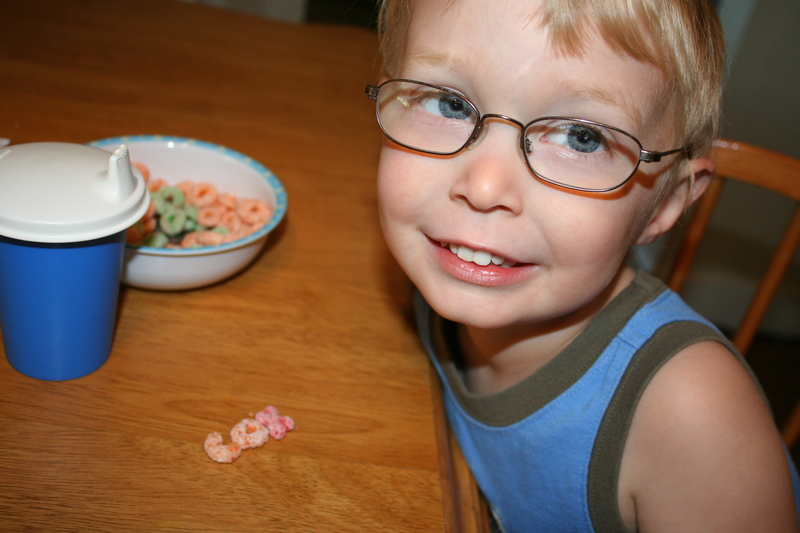 In Apple Jacks, no less. If you’ve looked at my Flickr lately, you know that this has been a good year for our pear tree. I learned last summer that we were picking the pears too early. Last fall we pruned the tree back pretty severely. We also thinned the pears a little in the spring and early summer. 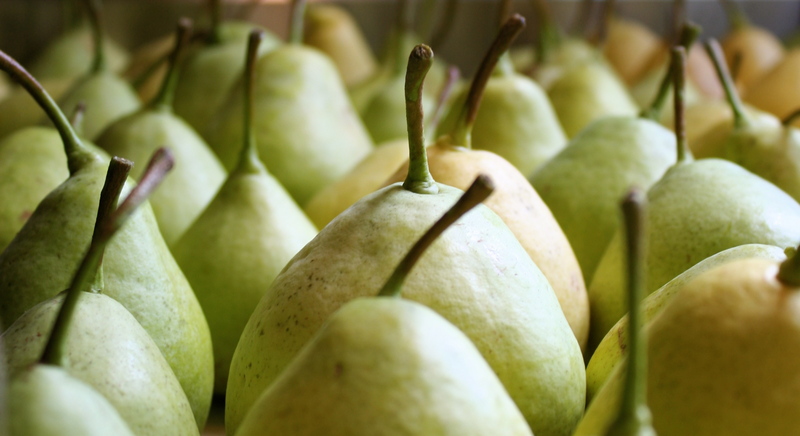 It really paid off–this year’s crop was abundant with big, sweet, juicy pears. We were able to share our bounty with lots of friends. 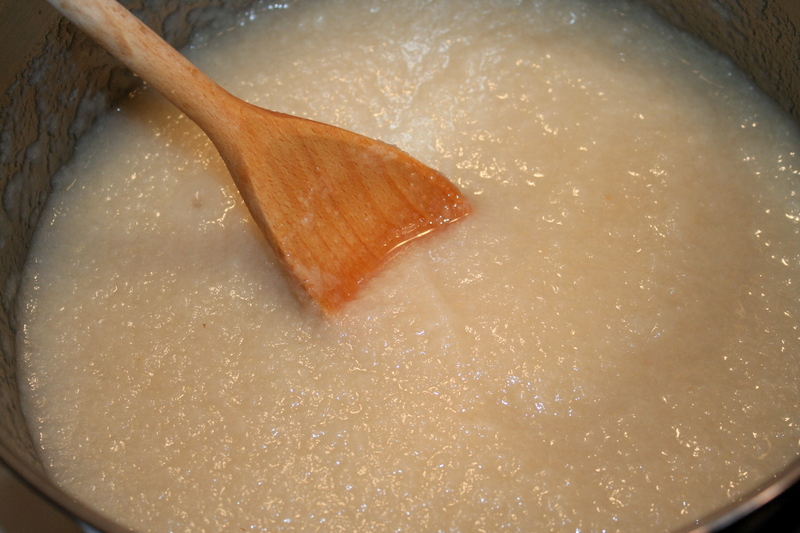 As I was divvying them up, I set aside all of the less-than-perfect pears and made some pear sauce from them. I added a 1-2 tsp. lemon juice and very small amount of water. Next time I’ll probably leave the water out completely. 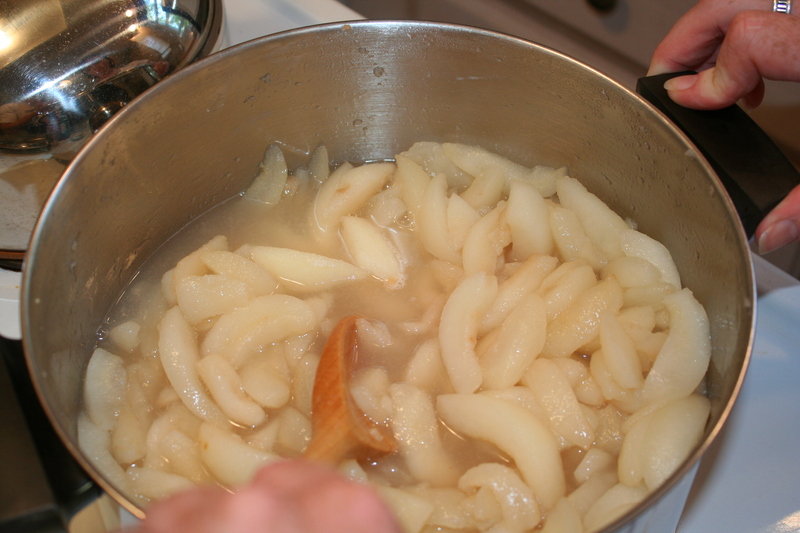 These pears were so juicy I had to strain them before running them through the colander. I’m very glad to have this colander set. My mom picked it up at a garage sale years ago. It’s the first time I’ve put it to use. 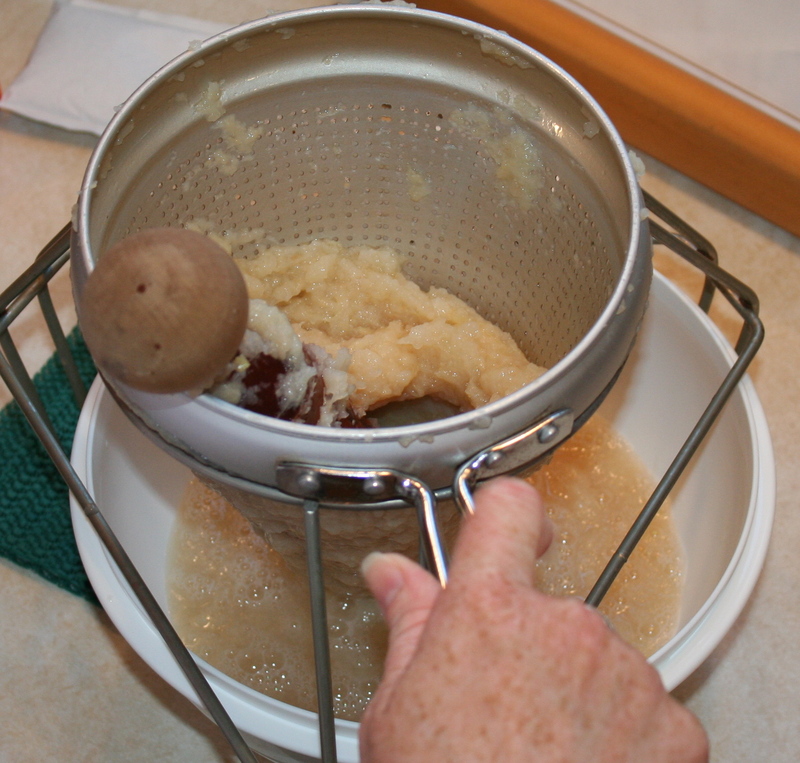 The recipes I looked at did not say to run the pears through a colander, but I’ve made applesauce enough with Mom to know that I didn’t want strings in my sauce. It was still fairly watery so I put it back on the burner and let it simmer for a few more minutes. 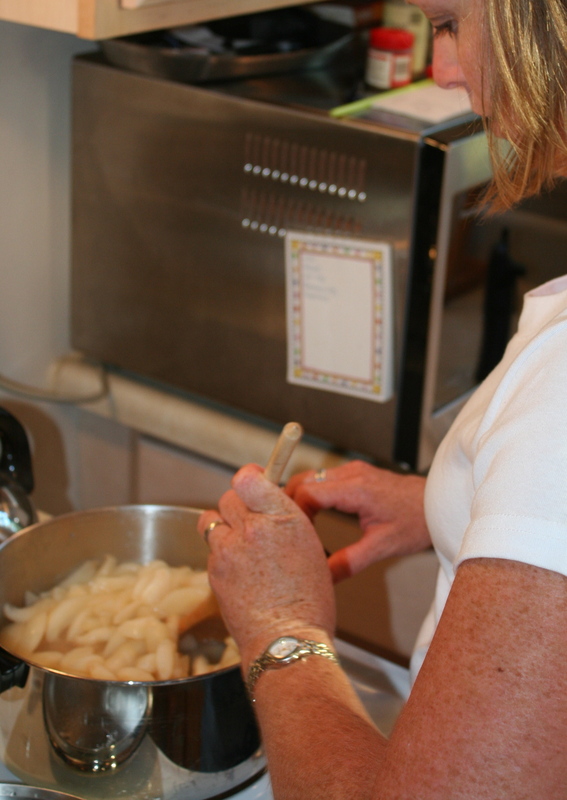 The pears were very sweet–I only added about 1 1/2 T of sugar. Delicious! Now I’m anxious for Stuckey Farm’s Golden Delicious apples to ripen. 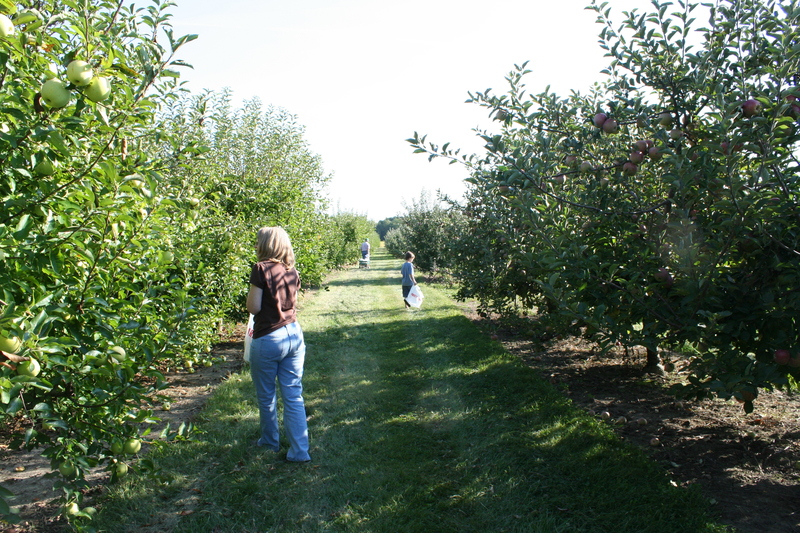 The late spring freeze of 2007 decimated the 2007 apple harvest. This year’s ought to be especially good. 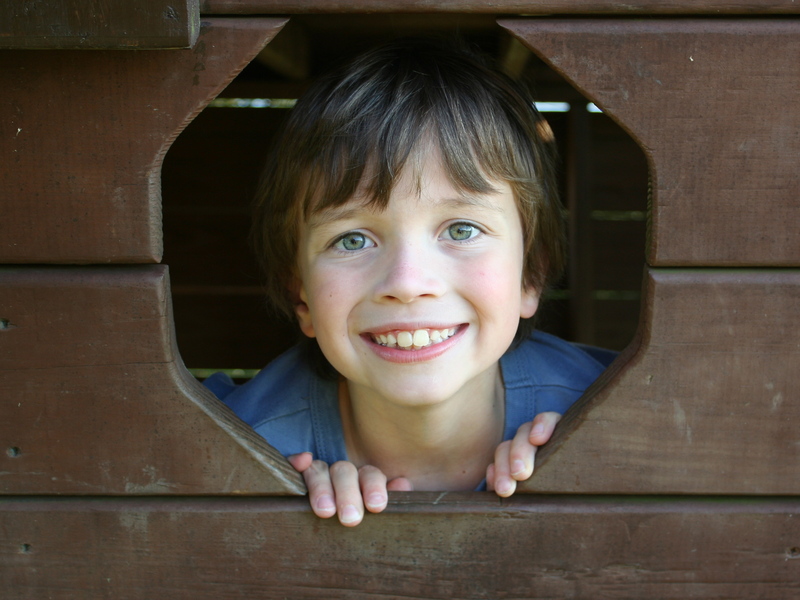 Visit my Flickr to see a few photos of Toby picking pears. IMG_4468, originally uploaded by jen d. cox. For the past three Septembers we’ve attended Northview Christian Life’s Hillfest. We always have a great time–they do such a good job with it. 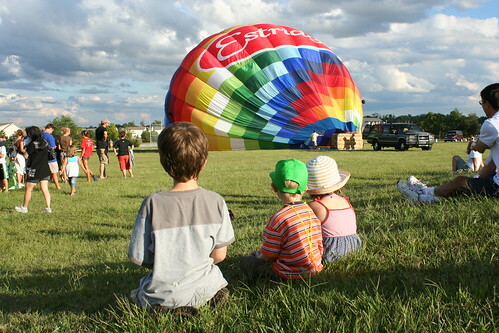 Last year we were able to hang out on the church’s property and watch several hot air balloons lift off. We’d planned to do the same this year. (NVCL’s property is the highest point in the county, making it a popular launch site. Around 6 o’clock we headed over to the grassy field where they had a balloon laid out on the ground. That’s when we noticed the line of people. They were doing tethered rides! Initially the wind was too strong but it died down fairly quickly. After over 2 hours of waiting, the kids and I were able to go up for a very short, tethered ride. We had a great time and made some new friends in the line to boot. Check my Flickr for more Hillfest fun.